When I first came to Orca Lab in 2008, I expected some sort of sign. Some sort of intimate and personal encounter with the whales to justify the sacrifices, work, and effort I had gone through to reach this place. Orcas, it turns out, have little interest in storybook endings. They went about their lives as if I were invisible. It was odd, the orcas owed me absolutely nothing, but so convinced was I that some spectacular, “ah-ha” moment would arrive, that to leave without having gotten within 200 yards of a whale was, not a disappointment, but a hit to the ego. It was a common enough question working on a whale watching boat, and I suppose it should have been predictable. I mean, the majority of my clientele had work that they actually looked at as, well, work. I just saw it as a free whale watch every day, like someone had offered me season tickets along the third base line for free. How could you get sick of that? The question would always rise to the surface just as the humpback was slipping below, meaning I had 5-7 minutes to explain why no, I don’t get sick of watching massive aquatic mammals breath. I’m nothing more than a commercial while the show dives 200 feet below us for another mouthful of herring. The guy who banters on stage while the band tunes their instruments. But for those that would probe, that actually wanted to know and weren’t just making conversation after realizing that no, your iPhone will not get service out here, I’d go a step further. But 100 yards stands between the deck and a trip of a lifetime. For the many who have read the stories of Erich Hoyt, Paul Spong, and Alex Morton, it’s a tantalizing distance. We want a moment like Morton had, being led by the A5s through the fog, or Erich Hoyt in his rowboat, bobbing in the bight, surrounded by whales. But that age of orca research and watching has come to an end. With restrictions and limitations enforced, we’re at the mercy of the whales to swim that football field distance and set the stage for the sort of encounter we crave. Perhaps we love them too much. Our addiction as harmful to them as potato chips are to our arteries. We crave these moments, and stand breathless on the deck of a swaying boat, hoping for a flash of white, a bubbling surface, an eruption of carbon dioxide as the whale breaks the water feet from us. And it does happen. After three years and countless hours on the water, I had a few holy s— moments; I was splashed by an orca, had one circle the boat, it’s oval eye patch staring into my soul, and had 14 humpbacks materialize from nowhere, surrounding us in a bubble net of desperate herring. And all it took was thousands of hours, and the sheer luck to be in the right place at the right time. Six years later I returned to Hanson Island, reluctant to share some of the most intimate whale experiences with my fellow volunteers. I had been extraordinarily lucky to have a job that allowed me to buy a lottery ticket every day and cash in on the minuscule odds. But that summer, I found a much more rewarding and fulfilling experience. As much as I’d loved my time on the water, a wriggling feeling of guilt had grown as I thought about the deafening noise my coworkers and I made in their home. The whale watch industry grew and with it, the pressure on the humpbacks and orcas until every daylight hour was spent in the company of at least one, and almost always several boats. I couldn’t measure how much of a disturbance I was causing, but the uneasy feeling in my stomach told me however much it was, my conscience was not ok with it. I began to despise the 700 HP engines on our stern, giving us the authority to decide when the whales could be free of us. Were these experiences worth the boat noise and fuel? The hours hovering above their kitchen table, knowing if it was up to them they’d probably have us disappear? Instead of intimate face to face encounters, I craved anonymity. I wanted to see, but not touch, observe but not alter, be it from 5 yards or 500 didn’t matter. Perhaps I’m biased. After all, I can still see that orcas tail rising off the stern of the boat, sending water cascading over us. But nothing felt as rewarding or special as a misty, fog drenched morning at Cracroft point. The group filed past, exhalations like gunshots ricocheting off the rocks. An image of A60s dorsal flashed in my mind, like the face of someone I hadn’t seen in years, the big notch two thirds of the way up the dorsal made him easy to ID, and as the picture filled my head, his dorsal filled my lens. I held my breath to steady the camera, and pushed the shutter, immortalizing Fife on a 6 GB chip. He couldn’t have been any closer than 150 yards, a distance many in the whale watch industry would yawn at. But a tear slid down my face as he disappeared. A few years ago I’d have wanted Fife to know I was there, to see some acknowledgement of my love and interest. Now… I wanted anything but that. Just to have a brief window into his world, and know that his calls were blowing out the speakers back at the lab was plenty. My favorite John Muir story involves a tiny dog named Stickeen. Fanatically loyal to Muir, Stickeen followed the famous naturalist everywhere, even the glaciers could not separate them. On one trip a storm hit. The light was fading, and they were still far from home. Between them and camp lay a large crevasse in the ice, a narrow bridge across offered the only hope of passage. Muir scooted across and turned to find Stickeen still on the other side, sprinting back and forth as the wind howled, panicked and too terrified to follow. Muir knelt down and reach out his arms calling to his companion. For a moment Stickeen remained perched on the edge of the precipice, and in a flurry sprinted across the bridge, past Muir and began to yip and run in circles in ecstasy. For years John Muir’s words have resonated inside me, echoing in my head with every major decision I make. I tried to avoid making decisions simply because they were safe or comfortable, probing deep inside for what I really wanted. With this credo echoing in both our hearts, we walked, hiked, and hitched through New Zealand. Bounced from seasonal job to seasonal job. Crammed everything we owned into the Pathfinder and drove for five exhilarating days to Seattle. And of course, spent the last six months blissfully happy on Hanson Island. Slowly we’ve watched our time remaining tick away, somehow, we have just two months left, and the thought of leaving already left a lump in our throats. In our wildest dreams, where money is no object, we knew we’d come back. But even here, the financial demands of life can reach us. Student loans, IRAs, and that house in Gustavus beckon. It became our next goal, to save up and buy that house, if the elephant in the room (winter work in a town of 350) could be addressed. Than Paul and Helena changed everything, offering to help us return for another winter if we wanted to. Thus began the hardest decision we’ve ever made together. 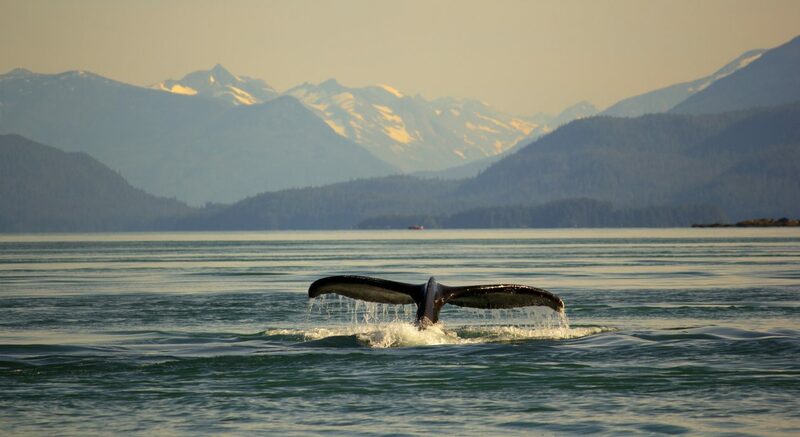 We tried to imagine returning to Alaska, kayak guiding in Glacier Bay and than… what? Making coffee in Juneau I suppose. Which was all well and good, but we both knew that at night, crammed back into our shanty studio apartment, we’d look out the window to find ourselves surrounded by street lights. And our souls would ache for this place. For the sound of the waves on the rocks. The Harlequin ducks bobbing like rubber duckies into the cove every morning, the mischievous mink that taunts the cat from under the house. We budgeted. We convinced each other that one decision was correct, and than the other. Finally, we would lapse back into fits of indecision. Pulled between starting to put down roots, and fearing that we’d eternally regret not returning to the island. We talked long into the night, unable to decide. Until this morning when Paul asked us if we’d reached a decision. We looked at each other across the table, a pained look on both our faces. We knew saying no meant we may never see this place again. And we knew that we couldn’t live with that. There will be houses to save for later. Winter work questions to answer, money to make, roots to set down. But in our hearts, the wanderlust called for an encore. To sprint across that ice bridge one more time. To risk our lives. And to save them. “We’re coming back!” we replied. And like Stickeen a century ago, jumped and ran around the cabin while the wind and rain pelted the windows.